I may have spoken too soon when I said I was pleased last week that Orphan Black has managed to avoid the sophomore slump I was concerned about for the series. This week there was a lot going on, as always, but for the first time it was too much. Honestly, it wasn’t so much the quantity of content, as the presentation of it. We lost the breakneck pace that we have come to expect from the show and what we got, for the most part, was a dull experience overall. This episode was all over the place, as all of the episodes are, but this time around it was not in a good way. 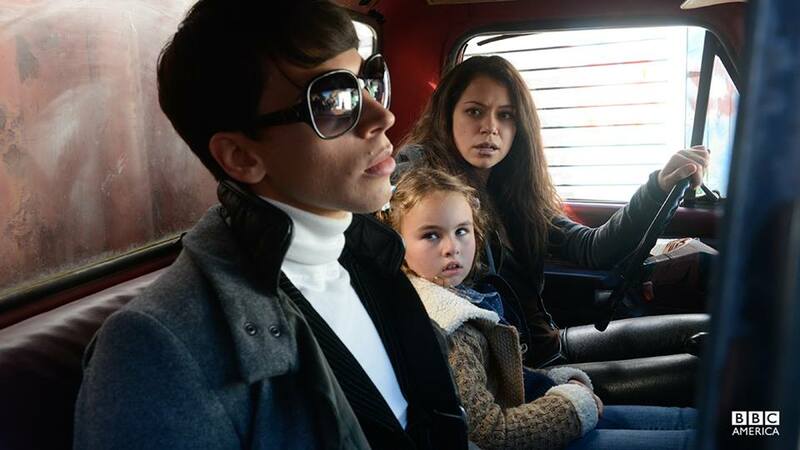 We open with Sarah (Tatiana Maslany), Kira (Skyler Wexler), and Felix (Jordan Gavaris) on the road after their make a run for it escape last week. Starting off with Fee’s camping quips, which weren’t as spot on fun as his dialogue usually is, we can see that we’re in for a different experience than we usually get with the series. Their brief time on the road, which could have been lots of fun, was just plain uninteresting and clearly only served to get them to the home of one of Sarah’s former marks, Cal (Michiel Huisman). Cal, of course, turning out to be Kira’s father. We all saw that coming right? Even seeing it coming, I was pleased with the interactions once Cal arrives on scene. I don’t think there’s anyone who doesn’t love and appreciate Michiel’s talent, so he is a great addition to the series in every way. He brought an early depth and likeability to Cal that was the only real bright spot this week. We find out the curious information that he was involved with a, let’s just call it unusual, scientific bee pollenating invention that ended up becoming a military weapon. This may or may not mean anything as far as our clones go, but since we know we can’t really trust anyone at this point, we’ll just have to wait and see what it means if anything. And, does the military connection somehow link to Paul? He was absent again this week, but I hope we will be getting his backstory soon. Felix then leaves, stating that there is no place for him there and that Alison needs him. In the end we have Rosen (Matthew Bennett) catching up with Sarah and ultimately taking her hostage leaving Cal to keep Kira safe. He already seems to have better instinctual parenting skills than Sarah, so I feel good about Kira’s safety, at least for the moment. Unless, you know, Cal is really the head of the entire clone thing and has just been hanging out in the middle of nowhere just waiting for Sarah to drop little Kira on his doorstep. Yeah, that’s a stretch even for Orphan Black. Catching up with our other clones we have Helena not being well received by Gracie (Zoé De Grand Maison), while her father Henrik “Hank” (Peter Outerbridge) and his right hand man Mark (Ari Millen) are out at the “Birdwatcher’s” compound. Finding Mrs. S’s handiwork the decision is quickly made to torch the place. They return to the ranch to take part in an unnerving cultish “bonding” ceremony between Helena and Hank. Afterward, as he carries his new “bride” away, all we can think is that she is clearly to be his latest insemination victim. Meanwhile, Delphine (Evelyne Brochu) is introducing Cosima to the newest of our clones, albeit another dead one, Jennifer Fitzsimmons. We get some backstory into Jennifer, via video diaries, as to how she ended up with the Neolutionists. Apparently she was the first of the clones to come down with the mystery lung illness and since she is recently deceased, we are treated to her autopsy. Though we do get some minimal information in regards to why the clones may be infertile, and an insight into Cosima’s possible future, the entire scene isn’t very interesting or seemingly necessary. After some anger vacuuming, Alison is unfortunately back to work on her musical. This was amusing when it was introduced, but “Blood Ties” has long since worn out its welcome with me. As she leaves rehearsal, she is intercepted by Angie (Inga Cadranel), a character I am long tired of seeing on my screen each week, leading Alison to believe she is now being double monitored by her and husband Donnie (Kristian Bruun). I think that’s a totally reasonable assumption for Alison to make and it really shakes her up even more than she already is. Twofold thanks come from our Alison scenes this week. First, she quickly dispenses with Angie and second, we should be able to say that the musical has finally run its course as we get to the opening night cringe worthy performance. Luckily, Alison is so drugged up that she falls off the stage, thus bringing an early end to the show. I was pleased to see that Felix was at the performance, though, and I did enjoy him finally showing a little backbone with Sarah and walking, or rather hitchhiking, his way away from her and back home to his life. His leaving did seem very abrupt, however, considering his deep connection to Sarah and Kira, and that made for a very odd out of character experience for us all. For the first time ever I was bored watching Orphan Black, so much so that I don’t even have a fun Fee quote to share with you this week. We got a little more important information from this episode, most notably Kira’s paternity confirmed, but otherwise it mostly felt like slow paced filler. Tatiana Maslany’s performances as each of the clones were again masterful and I will add that as a bright spot to this episode, as she had yet another clone persona to embody. She is truly doing an amazing job of portraying these very different, yet the same, characters. As per usual, there was a lot going on in this week’s episode of Orphan Black. With the lofty title of “Governed by Sound Reason and True Religion” what else could we expect? Actually, I think the only thing we didn’t get in this second episode of the season was another new clone. We know one is on the way, though. 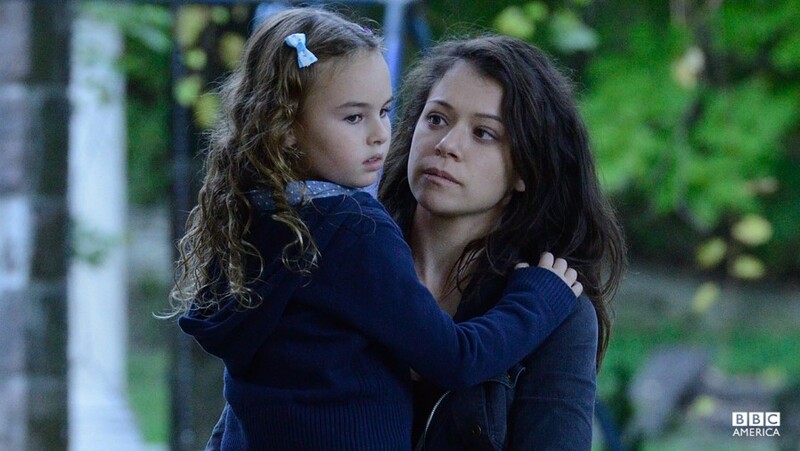 The episode opens with our not so dead, crazy clone, Helena in the hospital, while Sarah (Tatiana Maslany) continues her search for daughter Kira (Skyler Wexler) with an assist from Art (Kevin Hanchard) and Felix (Jordan Gavaris). While they’re trying to figure out why the Proletheans would abduct Kira, Sarah receives a call from her saying that she’s scared and that there’s a weird man there with her. Art traces the call and that’s all they need to be on the road to rescue our favorite/only clone progeny. They go to the hotel where the trace led them, but Kira and her captors are already gone. Daniel (Matthew Bennett) then shows up and while Art is dealing with him, Sarah follows a trail of clothing to a car where she is grabbed by creepy keeper guy, Benjamin (Julian Richings). Then the surprise, Sarah is brought to the first “safe house” she lived in when she originally moved to the area with Mrs. S (Maria Doyle Kennedy). Who, as it turns out, is the one who has had Kira all along. I expected that was the case and I’m glad the little one was safe. Meanwhile, Alison is attending Aynsley’s funeral and while being treated like a pariah there she intercepts text messages to husband Donnie, thus rousing her suspicion that he is actually her monitor. She then takes a drink, so much for clear headed sobriety, but we didn’t really expect it would last long did we? Cosima meets with Delphine and Dr. Leekie regarding their agreement and her new lab. She assures them that she is with them and not Sarah before they go for a tour of the lab. Though her “new” lab is pretty much just a rundown old lab Delphine assures her they will be able to have anything they want for it in their quest for a cure. Feels like too many false assurances here. We next pick up with Alison back at rehearsal for her bizarre community theater musical, where she’s clearly having a hard time. Felix then shows up and she rushes to him. They have a private moment where she tells him that she’s sure Donnie is her monitor and admits to being responsible for Aynsley’s death. As Alison downs tiny bottles of booze, they plan to set a trap for Donnie to determine if he truly is her monitor or just another innocent bystander. Yes, her sobriety, and sanity, were definitely short lived. Angela goes to Art with a picture of Helena in the hospital, but he tells her to just leave it alone. Of course she doesn’t and goes to the hospital anyway, but she arrives just after Mark (Ari Millen) has taken her. Poor crazy Helena is now locked up with the Neo-Proletheans, or as I shall term them the Fanatic Farmers. We find that Tomas (Daniel Kash), Helena’s keeper, is alive. Am I the only one who thought he was dead? Wishful thinking perhaps. Anyway, after a self-inflicted whipping session, he and Henrik (Peter Outerbridge), the leader of the new Proletheans, talk about Helena and how her organs are mirror imaged, which sometime occurs with twins. Is this true? I have no idea, but it’s an interesting idea. True or not, it gives us an explanation for how she was able to survive a bullet to her heart. We also get some insight into the beliefs of Henrik’s group and how much they differ from those of Tomas and the old guard Proletheans. Henrik sees God as opening a new door with science and completely disagrees with Tomas’ belief that Helena is an abomination. Alison and Felix spring the trap on Donnie and he follows her just as they planned. As he’s tracking her at the cemetery, he is having a conversation with Dr. Leekie. Alison confronts him for following her, but lets him off the hook, or so he thinks, now knowing that her suspicions are confirmed. Is he truly her monitor or something else? At the very least he’s a liar. Just not a very good one. Mrs. S is planning to take Kira to England to keep her safe. Sarah shows her the picture of Project LEDA and tells her that her mother told her that she was a part of the group. She adamantly denies knowing them, but that’s no surprise. Even if she were involved she wouldn’t admit to it. Sarah then goes to talk with Kira and when she shows her the Project LEDA picture she recognizes it. She doesn’t seem to trust Mrs. S., as she says she saw her going through her grandmother’s things. Sarah says they should go and Kira agrees. While they’re planning to run, Mrs. S. is getting a rude awakening in the kitchen finding out that the people she trusted at the safe house are really part of the Proletheans. She then kills them allowing Sarah and Kira to get away. So, Mrs. S isn’t a Prolethean or a Neoloutionist. Is she just an innocent bystander in all of this, who really just wants to keep Sarah and Kira safe, or does she belong to another group entirely? Only time will tell and I admit I have no idea any more. While Cosima and Delpine are planning out the new lab, Rachael joins them. She tells Delphine to leave and asks Cosima how she’s feeling while informing her of her recent blood test results. They then speak about Sarah and Rachael tells her that she wants her to find out why she is different from the rest of them. As the episode winds down, Alison calls Felix to tell him she has confirmed her suspicions about Donnie. Unfortunately, he tells her that he is leaving town for a while with Sarah and Kira. How does Alison deal with the loss of her Fee support? With booze and pills of course. Meanwhile, back at the ranch, Tomas and Henrik are still discussing Sarah and Helena when Tomas gets bolted in the head by Mark. Henrik then declares “It’s a brand new day.” But, what is the plan for Helena? We got a few answers this week but, as always with this series, we now have many more questions that need answering. The biggest of which is can anyone be trusted? At this point I think I only trust Felix completely. If they ever make him a bad guy, let’s say Sarah’s lifelong monitor, I will not be a happy camper. I admit that I was concerned there would be a sophomore slump with the show, as they started off with a first season that ran at a breakneck pace seemingly difficult to sustain. However, I couldn’t be more pleased that they have managed to continue into season two with the same blink and you’ll likely miss something pace that truly works and makes the show something special. I know some people find the pace to be too frenetic and overwhelming, but that is just one of the things that makes me really love the series. The other thing I most love about the show is the Clone Club, so it’s sad to see that we’re losing that, at least to some degree, this season. Season one was, for the most part, about discovery of the various clones and bringing them together. Season two, so far, seems to be about pulling them apart and isolating them from one another. Hopefully, for all of us, it will be a short lived separation. Just as I did last season with my reviews, I will be ending with my Felix quote of the week. Admit it, you all love Fee and he always gets the best lines. This week I’ve got a twofer as I couldn’t choose a favorite.